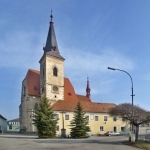 The church of Saint Mary Magdalene, which is located in the centre of Chvalšiny village, is an architectural first class monument. It was built in the late Gothic style between the years 1487-1507. 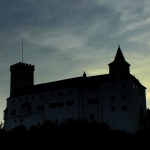 The early Gothic castle Rosenberg is located nearby Český Krumlov. Peak Kluk is located above Křemže village. If the sky is clear, you can see the opposite hill Kleť. Vítkův Kámen is a hill located above the Lipno lake. 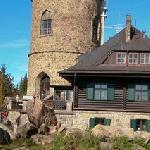 On its top is a ruin of a castle, which is the highest situated castle in the Czech republic. There was a military observation inside the ruin. The BezBot playground, a lot of fun in any weather! For families with kids. Come and play an adrenalin outdoor shooting game live on our playground and enjoy the whole whole day with your friends! Blanský les is a natural landmark, ideal for a whole-day trip, walk with kids or cyklotrip. Ptačí hrádek ("The Bird's small castle") is a monument of the prince Karel Ist Filip von Schwarzenberg. It has been reconstructed recently. The ecological farm is located in a small village Borová, 15 km nearby Český Krumlov.